As Texas Young Lawyers Association members, we are the future of the State Bar. If we don’t speak up now about what we want for the future, the future might not be what we had hoped. The State Bar addresses many of the significant matters affecting our profession. Our amazing staff at the State Bar administers bar services and benefits, but the priorities are set by the State Bar’s Board of Directors. In statute, TYLA has three representatives that sit on the board (president, president-elect, and immediate past president). These are the leaders that you elect to lead TYLA, and they also represent the interests of young lawyers on the State Bar Board. We are here to represent and listen to you. State Bar President Joe K. Longley has proposed changing how the TYLA president-elect is elected.1 Under his proposal, all 103,000 active State Bar members would be allowed to vote for TYLA president-elect. Currently, only TYLA members (age 36 or younger or in their first five years of practice, regardless of age) are eligible to vote for TYLA president-elect. The time is now to make your opinion known. When speaking up, don’t underestimate the power of using your voice. Expressing our thoughts and concerns is necessary not only in our daily lives but also in matters that affect our profession, such as fostering a positive view of Texas lawyers; starting, maintaining, and developing law practices that serve the various needs of Texans; and assisting those in need, lawyers and non-lawyers alike. By tradition and for good reasons, the State Bar delegates its public service priorities to TYLA, which is governed by its own board. The positions on the TYLA Board of Directors mostly mirror the State Bar board: There is a president (yours truly), other officers, directors who represent TYLA members in various districts, and at-large directors who are appointed to ensure the TYLA board represents the various backgrounds that comprise TYLA’s membership. The way TYLA and State Bar officers and directors know what to prioritize is by hearing from you. So, what we do on the State Bar and TYLA boards ultimately comes down to you. We’re here to listen to you because what you say matters; listening to you is literally why we are here. Contact your State Bar president, Joe Longley, at (512) 477-4444 or Joe.Longley@texasbar.com. Contact your State Bar district representatives and any at-large director (all listed here: https://bit.ly/2H9QuJC). When someone is willing to listen, don’t underestimate the power of your voice. We’re listening. So use your voice. 1. Joe K. Longley, One Member-One Vote? Not Quite, 82 Tex. B.J. 10 (2019). 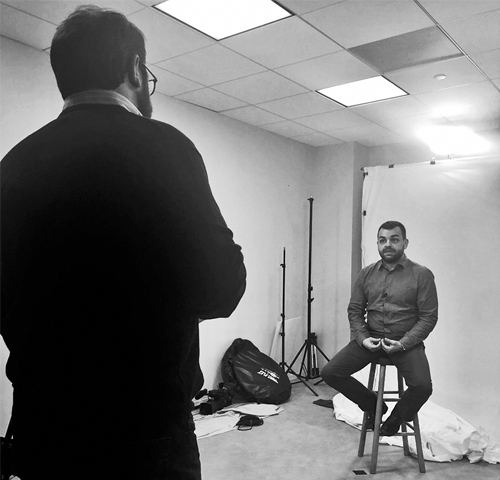 TYLA board member Ryan V. Cox interviews Lone Star Legal Aid fair housing attorney Velimir Rasic at the Houston office of Norton Rose Fulbright for an upcoming TYLA project about the Texas housing crisis and the cycle of eviction. 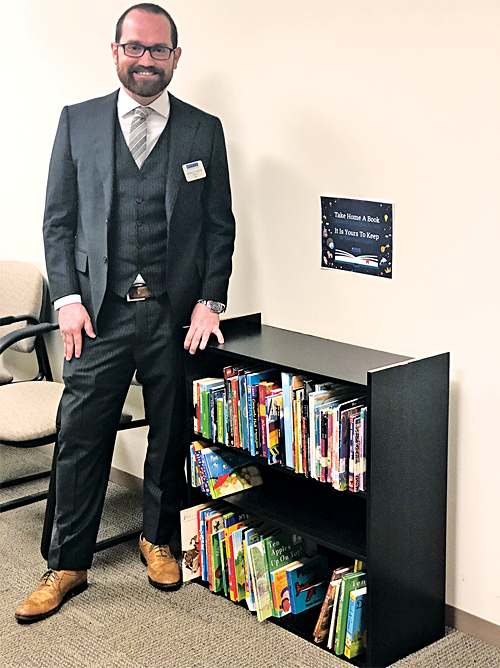 TYLA board member Nicholas Mosser refills books for the 470th Judicial District Court in Collin County as part of the Bookshelves in Courtrooms initiative. 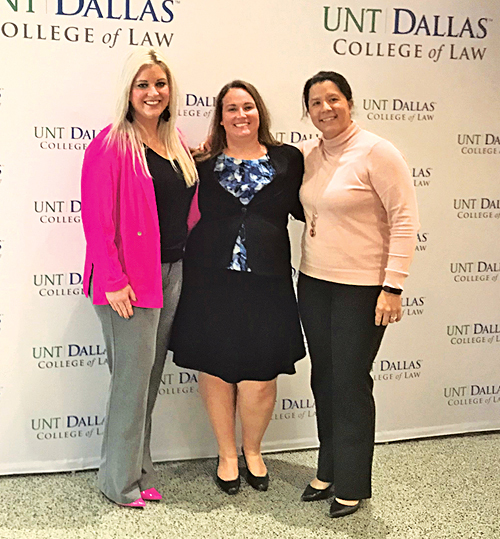 TYLA board members Erin Clegg, Sara Giddings, and Susan Smith presented What Do Lawyers Do? at UNT Dallas College of Law.